There were points in time during this read that I wondered if I would ever be interested in picking up an Alcott book ever again. I found her life to be depressing, mostly because of the way her father treated the family. Bronson Alcott was loved by his family, to be sure, but today we'd call him a "lazy bum" and he was that. He felt himself "too good" to work for money. He prided himself on his intellect (I'd argue about that too) and felt that others existed to support him and there was no need for him to "stoop" to physical labor to feed and cloth his family. Reisen makes no excuses for Bronson, but does suggest that he was mentally unstable. I would call the way he lived his life positively sinful and arrogant (or arrogantly sinful) and while I do believe he suffered from a depression (that was passed along to his daughter, Louisa!) I don't feel as if that is a good excuse. The man despised his family in thought, word and deed. I've no respect for him. Louisa, as it turns out, felt her family's deficiencies keenly and when she was older she purposed to make as much money as she could to pay off family debts. Writing for her was more about money than pleasure. It's hard to imagine, perhaps, given some of her tales, but it is true. 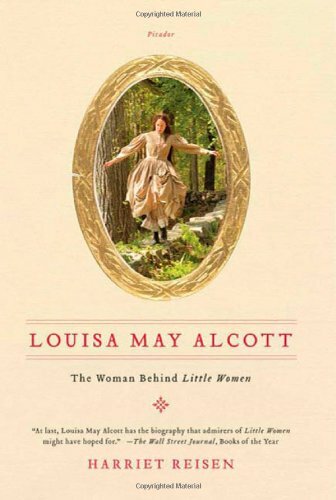 At the risk of this post being enormously long, and not getting to the part that I know you're waiting for, let me just say that if you are looking for a good biography to read on the life of Louisa May Alcott - this is the one!! 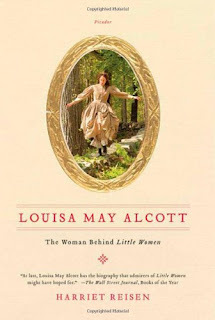 Now for the fun - Picador has graciously and generously offered a giveaway copy of Louisa May Alcott: The Woman Behind Little Women to one of you! Would you like to win? Simply leave a comment below (including a valid e-mail address)! This contest is open to U.S. Residents only and will be open through Tuesday, November 16th! THIS CONTEST IS NOW CLOSED. THE WINNER, as selected by random.org, IS #11 - Amy! Congrats, Amy! I hope you enjoy it! For you Facebook Fans (I am not one!) you might also want to check out the book's Facebook page. Thank you, Picador, both for sending me a copy and for offering one to one of my readers! I'm a big Alcott fan (Lousia, not Bronson! ), so I would love to read this. As light and wonderful as Little Women is, I was quite surprised at The Lost Summer and would definitely like to read an actual biography of Louisa May Alcott! I wonder how the film is and will explore that site more. I feel like a kid in school, jumping up from my desk and wildly waving my arms---"Pick me! Pick me!" I've been a Louisa May Alcott fan since before I ever read Little Women. Her's was one of the first little red Childhood of Famous Americans bios that I ever fell in love with. I even named my adoption doll (not to be confused with a Cabbage Patch doll) after her! Yes, yes, yes! I would love to win this book! Thanks for the opportunity, Carrie and publisher. I LOVE Louisa May Alcott and would love a chance to win and read this book. I knew her Dad wasn't the greatest, but I didn't realize he was that bad. Not wanting to "stoop" to physical labor to keep his family fed and clothed . . . sounds like a real winner! My email address is laarlt78(at)hotmail(dot)com. Thanks for the great giveaway! I saw the documentary and it was really good. I have always been a fan and read most of her books. I would love to read this. I toured Orchard House (the Alcott's home) last year and learned a lot about the family. In fact, I drove by the house again just last week. ;) I found it funny that the dad was a vegetarian but when he wasn't home the mom fed everyone meat. Or something along those lines. Would love to read this! Little Woman is an absolute favorite of mine! I have the book so don't include me in your giveaway but DEFINITELY read The Lost Summer of Louisa May Alcott - I read it first time this past May and just reread it. Well, you know I like biographies, and I love her books, so yes, I'd like to enter. I had read before that her father almost joined a "Shaker" community but it would have required not living with his family and they begged and pleaded with him not to, so he refrained. And though the March family sounds Christian, the Alcotts were more into Transcendentalism. But I have never read a biography of her.. I really enjoy biographies, and this one sounds fascinating! Thank you for offering this giveaway, Carrie. I would love to read this book. I have been a Louise May Alcott fan since I was child (a long time ago). I want read everything about her. I read some of her not so well known books as well as Little Women (4 times!) and Little Men (2 times). Wish that you had 20 copies seeking homes!!! I love Little Woman and I know I would enjoy this book! I also plan on reading The Lost Summer. It has been years since I read Little Women and Little Men. Time for a reread then I think I'll tuck into this book. Thanks for this excellent review. I'm stopping by from the Saturday Book Review Tour. Goodness, girl, what a review! How could anyone read the review and not want to read the book? Have you read the children's book by Gloria Whelan, Fruitlands? One side of me thought it was hysterically funny (she had a secret diary that no one saw and the "public" diary she knew her parents would read--with entries from each on facing pages). I'm interested in your description of Bronson as a "lazy bum", given the references to work found in Louisa's writing. I would love to have a copy of this book! One of my favorite stories! I would love to win a copy. Louisa May Alcott has been one of my favorite authors. I read most of her books as a teen, and still love them today. Definitely count me in on this giveaway! Loved reading your thoughts on it. My sisters and I love Little Women. Would love to give this to one of my sisters for Christmas. What a great find! Please include me! I would like to know more about her life, so please enter me in the contest. I love Louisa May Alcott! Please sign me up for the drawing!